See the world's leading Bee Gees tribute band at the Excalibur Hotel and Casino on the Las Vegas Strip! The Australian Bee Gees’ uncanny resemblance in both looks and sound to the popular 1970s band has garnered them international recognition. Sit back and delight in 75 minutes of legendary musical hits such as 'Stayin' Alive' and 'How Deep Is Your Love,' accompanied by video clips, arresting graphics and live camera images displayed on giant screens. Opt to include a buffet dinner option to enjoy a meal before the performance. 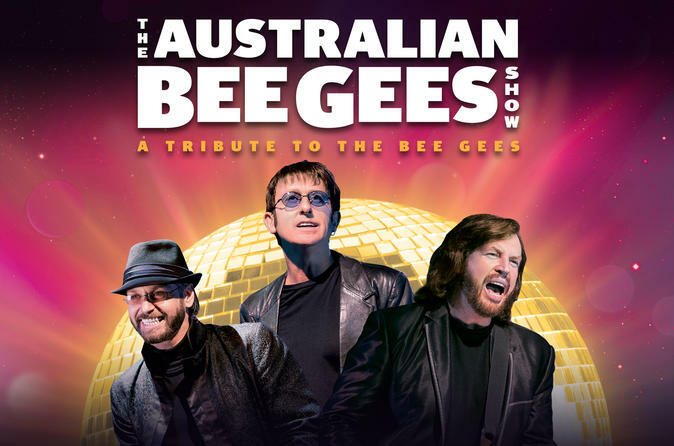 Head to the Excalibur Hotel and Casino on the Las Vegas Strip for your choice of two evening performances of The Australian Bee Gees Show: A Tribute to the Bee Gees — the world's leading Bee Gees tribute show. The Australian Bee Gees perfectly capture the look, sound and moves of Barry, Robin and Maurice Gibb in this 75-minute multimedia concert featuring state-of-the-art lighting and sound and giant screens displaying video clips, catchy graphics and live camera images. Sing along with Bee Gees hits such as Stayin' Alive, How Deep is Your Love, You Should Be Dancing and Jive Talkin' during this lively celebration of the band's musical legacy. Choose from regular or VIP seating, or opt to savor a dinner buffet before the show. This rousing performance is the perfect feel-good start to a night out on the town! Special Offer - Receive a complimentary seat upgrade from Category B to Category A and save 15% OR receive an upgrade from Category C to Category B and save 17%! - Book Now!